In an interview with Dan O'Brien, Niamh Mac Sweeney asks how the economy is performing and how growth prospects are going to affect the millennial generation. Dan O'Brien, Chief Economist, Institute of International and European Affairs. The economic world is changing, according to economist Dan O'Brien. He explains how today, and in the future, the millennial generation are going to have to adapt their outlook in line with changes across the economic landscape. "The world is growing at a slower pace and there is less economic growth than there was 20 or 30 years ago in most developed countries," O'Brien says. "That means that people are getting richer at a much slower pace, and possibly not getting richer at all." The old view that we were on a permanent upward trajectory and that the next generation would always be better off than the previous one is now in question and according to O'Brien, this is having a major impact on many things such as people's view of life, their prospects and the potential return on their investments. Changes in the economy's performance can be linked to changes in the labour market. O'Brien says the best way to measure what's going on in the labour market is not by measuring the unemployment rate because that doesn't take into account those that drop out of the labour market and who aren't looking for work. Instead, the best way to measure what's going on in the labour market is to look at the share of the adult population that is working. "Despite the slower growth in the world, more people are working," O'Brien explains. "A larger proportion of adults work than in the past and a big part of that has to do with higher female participation in the labour force. People are retiring later and we are also seeing a rise in the number of people working that are over 65 years of age." The notion that 70 is the new 50 has taken hold. Life expectancy is increasing with men's life expectancy up from 78 years of age in 2011 to 85 years in 2046. For women that number has jumped too, and females can now expect to live until at least 89 years as opposed to 82 in 2011*. 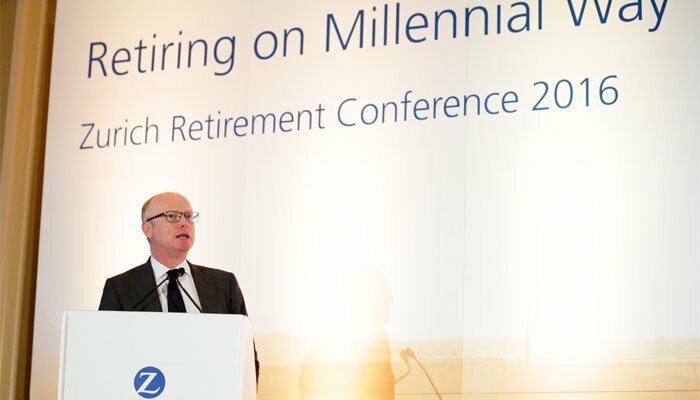 "That is a factor that the millennials, like it or not, are going to have to accept", O'Brien says "and unless they have saved and put an awful lot of it into pensions, the likelihood is that people are going to be working for a lot longer." O'Brien points out that while it is a positive development that people are living longer, healthier lives, we need to consider the impact on the cost of supporting the retired population, and whether or not the State pension will sustain those in retirement for a longer period of time. "The pension strain on the public system is going to be more stretched just because the population is older. But there are other factors at play too. People change jobs more frequently and there are fewer defined benefit pensions on offer. This can lead to a decrease in the number of people starting a pension because they might feel that investing in a defined contribution pension is not as predictable an investment as a defined benefit pension," O'Brien warns. In conjunction to an aging population that is working longer throughout their lifetime, developed world economies are also saving less. "In recent decades the structure is changing," O'Brien says. "We have lower growth rate, people living longer and fewer people dying. People tend to save more in the prime period of their lives and run down the savings as they get older. Now that the demographics have changed we have a lot more people of an older age who aren't saving as much. Equally, there is a decline in savings and in the habit of saving in the developed world in general." Putting changes in the global economy into an Irish context, O'Brien says that Ireland will fare better than our European counterparts due to our higher birth rates. However, it's not all good news as Ireland's current and future economic performance depends on the country's growth prospects. "As growth has been slowing in most developed countries over the past decades, in the 1990s it just exploded into life in Ireland,"" O'Brien recalls. "Ireland was the fastest growing developed country in the world for a long time, and in that way, we have gone the opposite to the long-term trend of most developed countries." So where are we now and what does the future outlook hold for a country that was once the fastest growing country in Europe but suffered the harsh hand of the global recession? "Where we are now is a lot better than where most countries are at present. We are growing stronger but that is still a 'recovery' growth. By most indicators we are not back to where we were in 2008. Obviously, back then economic indicators were inflated by something that wasn't sustainable at the time. Eight years on from that and to still not have fully recovered is almost a lost decade, however there are also a lot of positives in the Irish market too that can encourage greater economic growth in the future," O'Brien concludes. Dan O'Brien is Chief Economist at the Institute of International and European Affairs. He is also Adjunct Senior Research Fellow at the School of Politics and International Relations at University College Dublin and a columnist and economics analyst for the Independent Newspaper. Previously, he was economics editor of the Irish Times and is a regular commentator for international media organisations such as CNN, the BBC, the Herald Tribune and the Financial Times.